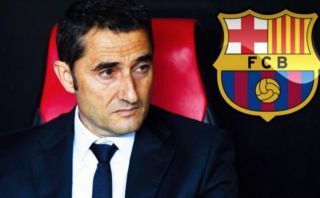 Barcelona president Josep Maria Bartomeu has insisted that coach Ernesto Valverde, Philippe Coutinho and Jordi Alba will not be leaving the club this summer. The Catalan giants remain on course for a successful season this year, as they remain six points clear at the top of the La Liga table, while they’re still in contention for the Copa del Rey and Champions League. With that in mind, it doesn’t appear as though they need to make too many changes to the current squad, and Bartomeu has reiterated his desire to keep key individuals at the Nou Camp. Those include Valverde, Coutinho and Alba, as well as Gerard Pique and Ivan Rakitic, with question marks being raised over the first trio in recent months for varying reasons, from contract renewal issues to transfer speculation touting an exit. “Valverde has a contract for next year and he’s happy to continue, and I want him to continue even if we don’t win anything this season,” Bartomeu is quoted as saying by Marca. “Being Barça coach is a heavy responsibility, but I think he’s very settled at the club. Meanwhile, the Barcelona chief also spoke glowingly of Ousmane Dembele who appears to be proving his worth for the Catalan giants this season, with the 21-year-old scoring 13 goals and providing five assists in 27 appearances. Coupled with talk of a renewal offer for Lionel Messi, it would appear as though the attacking duo won’t be going anywhere any time soon either. “We hope Dembele continues like this,” Bartomeu added. “He has great talent, every time he comes out to play, he’s surprising us, I’ve talked to him at 1.30 in the morning, he wants to succeed, he’s winning the heart of the Catalans. That will undoubtedly be music to the ears of all Barcelona fans, as the 31-year-old has continued to lead their charge with some mesmerising displays already this season, having bagged 29 goals and 17 assists in just 27 outings as he continues to perform at a remarkable level on a consistent basis.